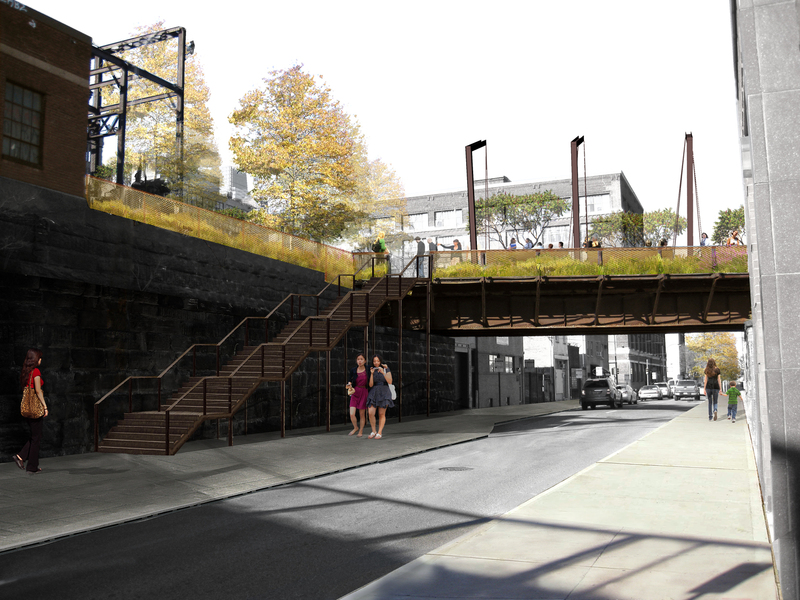 With $3.5 million in capital funds from the State of Pennsylvania, today the Center City District will begin construction on the much-anticipated Reading Viaduct Rail Park. An official groundbreaking ceremony to mark the first phase of the $10.3 million project will be held at 2:30PM at 13th and Noble Streets. 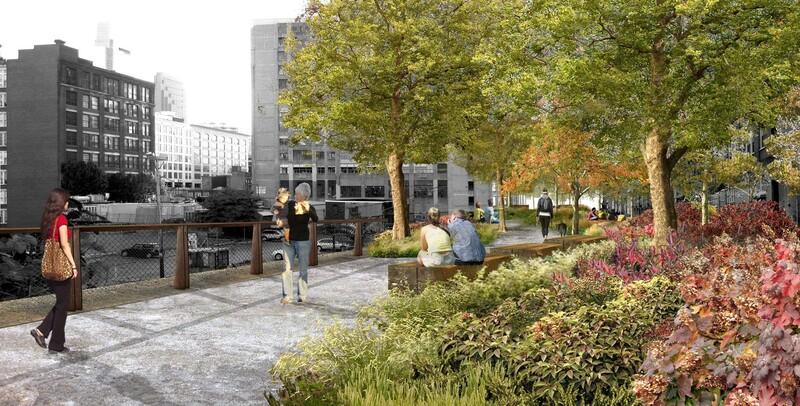 Governor Tom Wolf, Mayor Jim Kenney, Sarah McEneaney, president of Friends of the Rail Park, and Paul R. Levy, president and CEO of Center City District will host the event. Construction of phase one, designed by Studio Bryan Hanes, is slated for completion in early 2018. 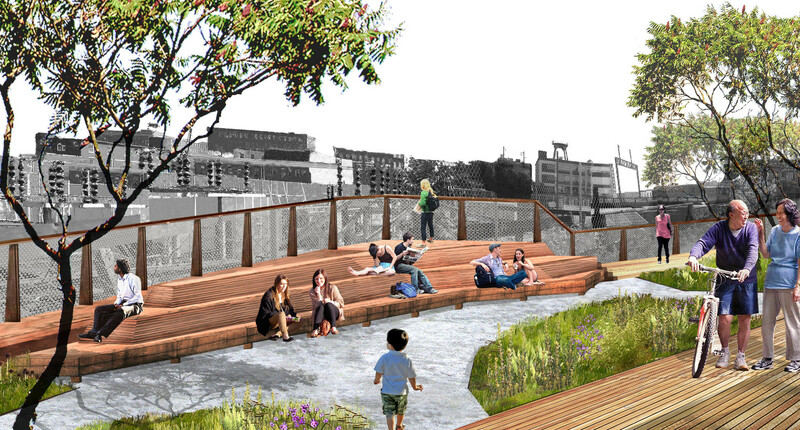 When improvements are finished this 25,000-square-foot section of the elevated park will feature a walking path, seating, gathering space, landscaping, and lighting. 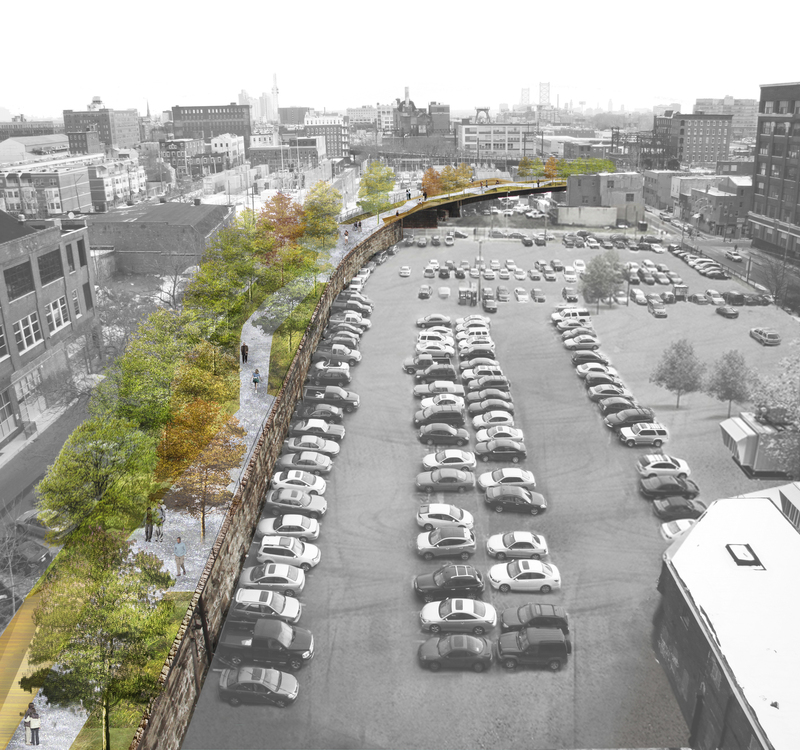 Spanning a quarter-mile, the park will extend from Broad Street across 13th and 12th Streets to Callowhill Street. 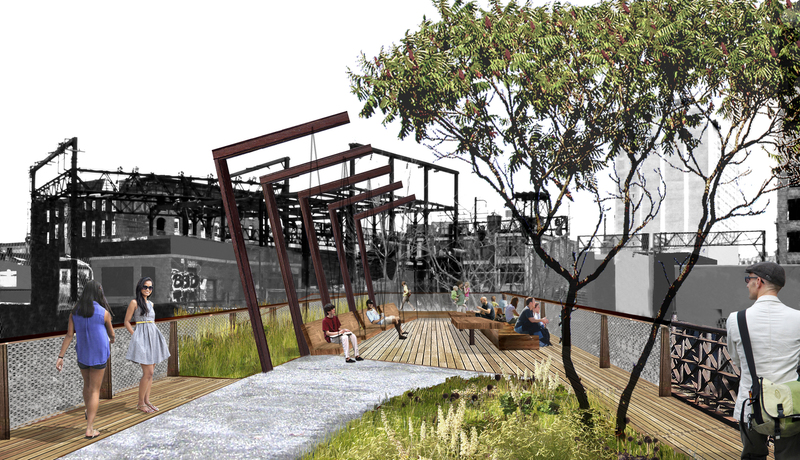 If the vision for the Rail Park created by Friends of the Rail Park comes into full fruition, the park will eventually extend three miles above and below ground from East Poplar to Brewerytown and include space for retail and bike paths. SEPTA is leasing the elevated railway to the Center City District during the park’s construction. 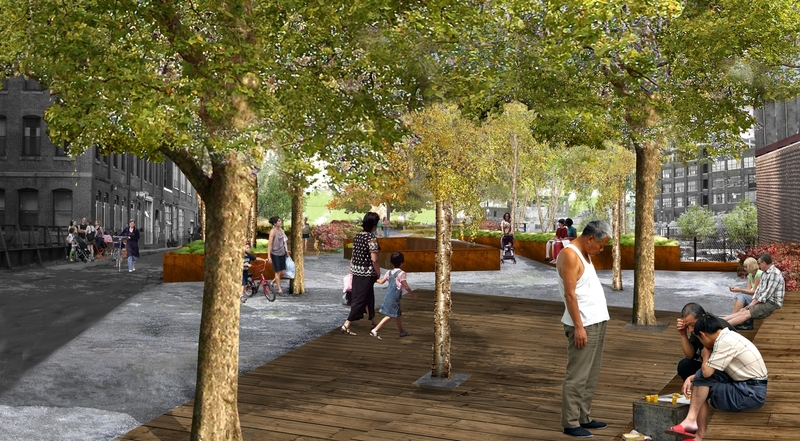 Once the project is complete the City of Philadelphia will take ownership of the completed park and maintain it through a partnership with Department of Parks & Recreation, Streets Department, the Friends of the Rail Park, and the CCD. 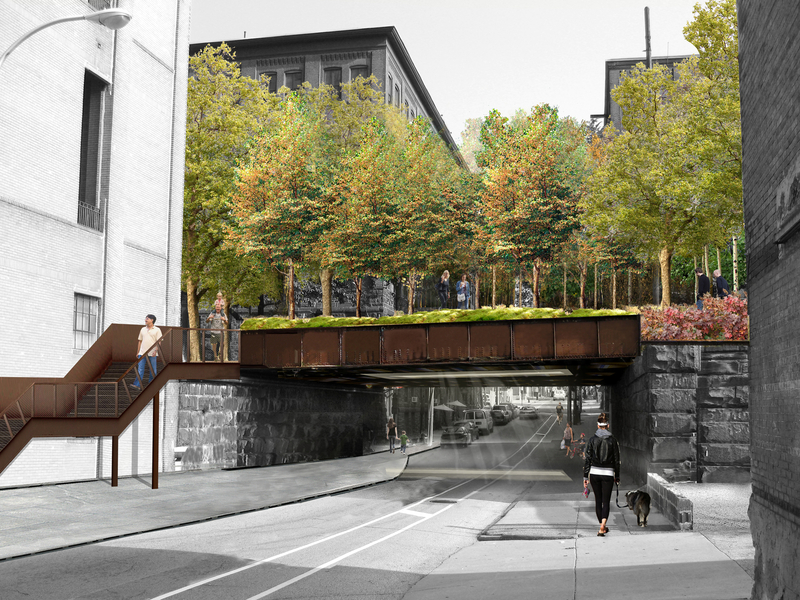 I’m all for the elevated portion of this project but some people are insane for thinking an underground park is a good idea and a better use than mass transit in the city branch. It’s a no brainer to utilize the city branch for bus / rail to link Broad St. with the parkway, Fairmount and then eventually terminate at 31st and Girard in Brewerytown where the trolley already is. The war over the reuse of the trench and tunnel is over people ! We friends of the Rail Park have basically won the argument! Transit won’t be there unless your talking about bikes and shoes. Once people get to enjoy the first phase of the park it’s only a matter of time and money for the viaduct and trench to follow. It’s gonna be beautiful ! Just because you won, doesn’t mean you’re right. A certain Edmund Bacon comes to mind when it comes to this topic. Spring Garden/Fairmount/Vine Street are perfect east/west thoroughfares to improve for bikes/pedestrians. Instead of blindly focusing on flipping any available space for a park, there is a community that should be carefully planned around the Viaduct. Also, all parks aren’t created equal, the Viaduct could be anywhere from poorly designed to magnificent. I don’t see the urgency in increasing territory when there is no guarantee this group can achieve the latter. Yes, because we’re going to have so much cultural & educational programming on an elevated park…What? The High Line in NYC, which these renderings look like a replica of, has been a catalyst for neighborhood growth and urban development. Treat it as such.